Finally the last information about where Food For Action is cooking: Teglholmen. From the main Train Station, ride the S-bahn (A or E) to Sudhavn and walk westwards for about ten minutes down Tegelhomsgade (a street that leads to the water). You can also take the bus directly here: Bus 10, but be careful to take the one that goes all the way to Tegelholmen (some buses don‘t go that far). We have a danish cell phone. The number is (0045)21528511. Our internal Food for Action meet-ups are going to be everyday after breakfast and dinner (10am and 10pm). People’s activist kitchens are cooking for (and with) the climate activists in Copenhagen; they are non profit mobile kitchens from Sweden, UK, Germany and the Netherlands. They support activists with delicious organic, vegan and regional food. The kitchens are autonomously run; they are not a non-political ’service-station’; and they would really appreciate some help – when you have a little time. The meals are on donation basis and the suggested donation is 20 kr, (around € 2,5). There will be food all days at breakfast, lunch and dinner time. Check out where the kitchens are located on this map. One of to two big sleeping spaces we have is called “Teglholmen”. 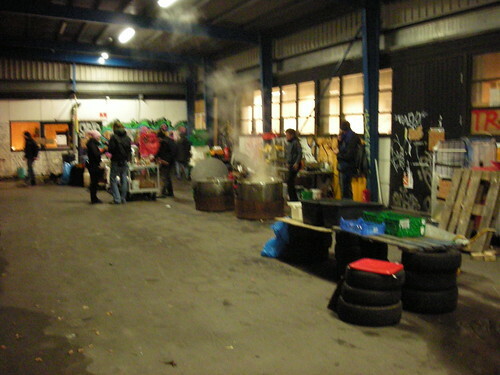 It’s an old industrial hall that can accommodate quite a lot of activists, the exact number will depend on how many fire doors can be built, but it can hold between 1000-2000 people. The place is located in the South Harbor of Copenhagen, see exact location on map below. The place will feature heating, electricity, water, toilets, a peoples kitchen, and maybe some showers. You need to bring your own sleeping bag and pad. The other big sleeping space we have is Ragnhildgade. It’s a space with old industrial buildings in the North Western part of Copenhagen. It can hold between 1000-2000 people, depending on the last permissions, this is as well a legal sleeping place. It will feature heating, electricity, toilets and other basic stuff (like a peoples kitchen). You need to bring your own sleeping bag and pad. See exact location on map below. Du browst gerade in den Food For Action Weblog-Archiven nach dem Monat Dezember 2009.